A LARGELY forgotten part of Woking history is to be revived in a new play centre on the high-profile site of the former Blockbuster Video in Guildford Road. The unsightly abandoned premises is to be transformed into a large play centre with a number of zones. One of these, a children’s garage, will be called Conway and will be a replica of the glass-fronted showrooms and filling station of that name that occupied the site in the 1930s. 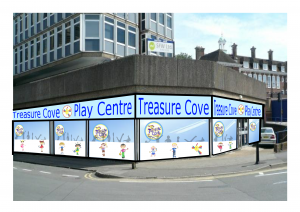 Yvonne Frew, senior manager of the Treasure Cove Play Centre, said the intention was to acknowledge the local history. “The story of Conway garage will be displayed and a caricature picture of Mr and Mrs Conway will feature on an adjacent wall,” Yvonne said. The new venture will also occupy the site of two former food shops next to the old Blockbuster. The play centre, which is expected to open in early November and will run seven days a week, will also feature a huge model ship, with role play activities for children as pirates, mermaids, fairies and superheroes. There will also be a children’s music corner and stage and an interactive sensory baby and toddler area. There will be a café and the venue will be available for birthday parties. Yvonne said that she hope to run occasional closed sessions for disabled children who may struggle to cope with a busy play centre on a regular day. Similar play centres, called Little Street, are running in West Byfleet and Frimley. Cllr Mark Pengelly, whose Mount Hermon ward includes the site, welcomed the new venture on a “dilapidated eyesore slap bang on one of the main roads into Woking”. Cllr Pengelly also welcomed the reference to Conway West Motor. “Woking’s changed so much over the years and I’m sure that many local people, like myself, never realised that a garage stood on that site previously. It’s great to see our local history being celebrated in this way and also to help to educate people about it,” he said.